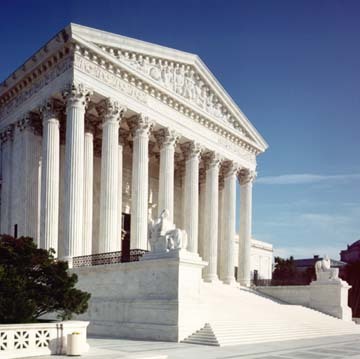 On June 6, the U.S. Supreme Court granted writs of certiorari in two Texas death penalty cases, and will review the constitutionality of those death sentences during its next term. The two cases are Buck v. Stephens, in which Duane Buck was sentenced to death after a psychologist testified at his penalty trial that the fact that Buck is African-American increases the likelihood that he presents a future danger to society; and Moore v. Texas, a challenge to Texas' unscientific test for determining whether a defendant is intellectually disabled and therefore exempt from execution. Texas, through its then-Attorney General John Cornyn, had conceded that seven death row prisoners, including Buck, had been unfairly sentenced to death after juries in their cases had been exposed to expert mental health testimony improperly linking race and future dangerousness. The other defendants whose trials were tainted by such testimony were granted new sentencing hearings, but Buck's case did not reach the courts until Cornyn had become a U.S. Senator, and the new Attorney General (now Governor), Greg Abbott, opposed granting Buck a new sentencing hearing. The Court granted review on one of two issues presented in Bobby James Moore's petition for certiorari, whether a state may reject current medical standards in determining intellectual disability. It initially appeared to have granted review of a second issue as well, whether Moore's "extraordinarily long" confinement on death row violates the Eighth Amendment ban on cruel and unusual punishment. However, in an updated order, the Court clarified that it was limiting its review to only the intellectual dsability question. Moore was sentenced to death more than 35 years ago, and has been diagnosed as intellectually disabled by medical professionals. The Texas Court of Criminal Appeals rejected his intellectual disability claim in 2015 because he failed to meet Texas' “Briseño factors,” a set of unscientific criteria based on the fictional character of Lennie Smalls from the novel "Of Mice and Men." The Court also took action in two other capital cases. It vacated the Alabama state court's judgment affirming the death sentence imposed on Ronnie Kirksey and ordered the Court of Criminal Appeals of Alabama to consider the constitutionality of Kirksey's death sentence in light of Hurst v. Florida—the third time ithe Court has directed Alabama to review its death penalty since Hurst was decided in January. The Court also denied Louisiana's petition for writ of certiorari in Cain v. Brumfield, from a federal appeals court decision affirming a district judge's ruling that Kevan Brumfield had intellectual disability and is ineligible for execution. Last Term, the Supreme Court ruled that a federal district court had properly granted Brumfield an evidentiary hearing to determine whether he had intellectual disability, after Louisiana's state courts had denied Brumfield funding to develop evidence of intellectual disability and then rejected his claim of intellectual disability for failure to present sufficient evidence of his disability. (C. Geidner, "Supreme Court To Hear Cases Challenging Two Texas Death Sentences," BuzzFeed News, June 6, 2016.) See Race, Intellectual Disability, and U.S. Supreme Court.